Hoo boy, another crappy day at work as I desperately try to put one foot in front of the other under the crushing weight of my depression. (Being a powerless, underappreciated wage slave doesn't help.) At least I didn't drink last night and reset the clock once again. 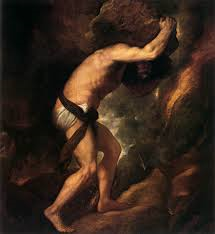 But Sisyphus teaches the higher fidelity that negates the gods and raises rocks. He too concludes that all is well. This universe henceforth without a master seems to him neither sterile nor futile. Each atom of that stone, each mineral flake of that night-filled mountain, in itself, forms a world. The struggle itself toward the heights is enough to fill a man's heart. One must imagine Sisyphus happy.